Product prices and availability are accurate as of 2019-04-26 08:04:47 UTC and are subject to change. Any price and availability information displayed on http://www.amazon.com/ at the time of purchase will apply to the purchase of this product. Coffee in Washington DC is some of the BEST in the world. Why because some of the BEST in the world travel here. Having a Washington DC souvenir coffee mug is a must to remember the coffee you enjoyed while in the city. Plus back home it is a great conversation starter. 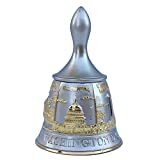 This beautiful souvenir Washington DC mug with a wrap-around montage of DC landmarks, will bring back the memories of your last trip here. The tall etched coffee mug is colorfully decorated with graphic of color images. It also has a textured etched lettering. This DC coffee fashionable mug will evoke memories, memories of your travel, vacation experiences for years to come. Of course this DC mug is Dishwasher and microwave safe & is a great gift! A beautiful souvenir mug with a wrap around montage image of Washington DC landmarks. The tall etched mug is beautifully decorated with graphic color images and textured etched lettering. This fashionable mug will evoke memories of your travel experiences for years to come. The mug is Dishwasher and microwave safe & is a great gift! 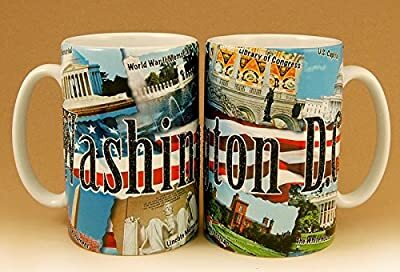 18 oz Ceramic mug The perfect size for your favorite morning beverage or late night brew Washington D.C. Souvenir Dishwasher and Microwave Safe Treat yourself or give as a gift to someone special!